As you bought the complete set the easiest way to swap between sm and enduro is to slide out the forks with brake and wheel as one unit. Quikest change, best setup. Thank you, thats the exact info I was looking for. Although I was looking forward to using the Beringer brake, I understand. So how much is a complete set of WB front forks w/tripples , & a 4 puk berringer brake set up w/disc & hardware all the way to the lever on the bars worth ? Also the rear shock off the 07' FS650 ? Looks like im in the market to sell if this isnt going to be my path. I usually gage some of that stuff on how much they are going for on ebay. I would say between $400-$600 for the FS forks. There are a set of 08 KTM WP forks going for $600 right now. Triple clamps if they are 17mm $200 - $250. They are rare. And that's half price of new. I bought the FTE radial supermoto complete brakes for $450 on ebay. For what its worth, the 4pot and the older 6pot calipers don't really work with off road wheels anyway, the angle of the spokes is such that the spokes rub against the caliper, so you have to use a grinder or file or some such to grind part of the caliper off to get the spokes to clear. I have an FS650 '08 which had been running with offroad wheels from time to time and the caliper was butchered in this way when I bought the bike. I got the offroad wheels as spare with the FS. I dont think you will ever find yourself in a situation where you would *need* a 310mm disc on a 127kg bike in dual sport trim. I think even for general road use on a SM, the 310mm with 4 or 6 pot caliper is waay overkill, and only really necessary for track use, where you are constantly braking at the limit in almost every corner. Even in Motocross where there there is constant hard braking, the 270mm disc with 2 pot is more than sufficient. I have ridden my FE501 with SM wheels on many ocasions, and just used the standard 270mm and 2pot combo, and never had any issues regarding stopping power. 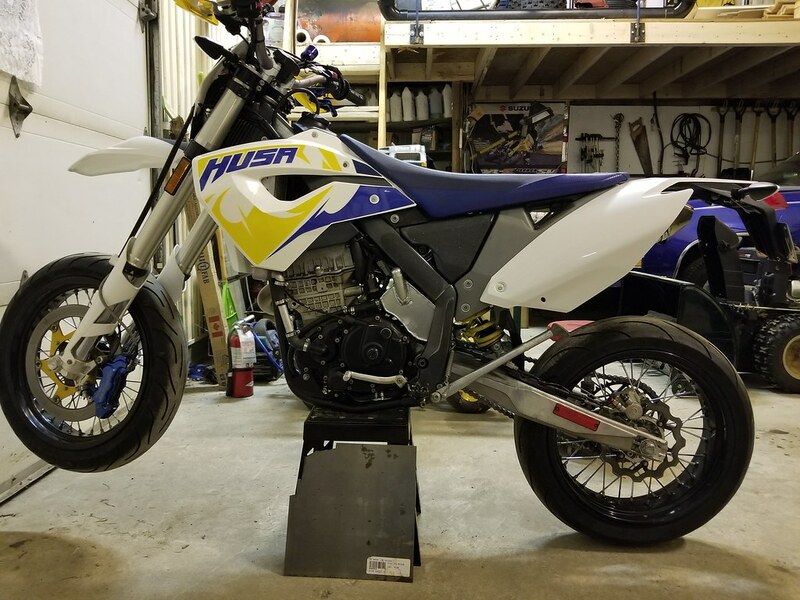 Obviously, having the 310mm on your Dual sport will have more stopping power, so it is the superior setup, but is it necessary? Maybe if you plan to load the bike with luggage or a pillion, then I would say it would be worth it. As for FS shock and forks for dual sport, I wouldn't. Like Pollo said, they are very stiff, and very uncomfortable when riding offroad. Also, the less travel in the suspension makes the rake angle steeper and the steering is very twitchy for offroad, especially at higher speeds on dirt roads. if you want to go back and forth with off road and supermoto set-up you better get the axial mounted Beringer brake and swap the caliper for the stock one when you're putting your off road wheels back on. It's easy and bolt-on. The off road suspension set-up is a bit plush for road duty but it does work ok. I use my bike only as supermoto so i've set-up the suspension accordingly, but front cliper is still axial mounted. works great.